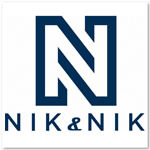 The NIK&NIK Calida Skirt is a blue skirt. The skirt has pleats and a loose fit. The skirt is made of 100% polyester. The Calida Skirt is also available in black with all-over flower print.